This entry was posted in Alcohol, Success Story on January 22, 2011 by ATMC Team. I’m hopeful and excited about my future. Back when I started the program I said to somebody that I just wanted to feel strong again, and I do. What can I say – I can’t complain. I started drinking regularly at age 13, my freshman year in high school. Just on the weekends- innocent enough. By 18 (college), I was binge drinking all but one night a week, but that was pretty standard for my school and my friends. At 21 I lived in Italy for a while, where it was normal practice to have drinks with lunch and so forth. I eagerly picked this up and started drinking here and there in the afternoons if I had them off. I began starting out some mornings sipping wine by 24 (Why not? I was working at home), and by 28 I no longer had a “say” in the matter- I pretty much had to drink all day, every day to avoid withdrawal. So, it was just steadily progressive for me until it became a necessity. My life had gotten pretty out of control by the time I got to ATMC. I had felt like a gypsy for 2 years (since being laid off from my job and REALLY starting to struggle with addiction). Moving into my mom’s, then staying in a friend’s second bedroom, then at my boyfriend’s (who has an addiction of his own) dad’s house, then at his brothers, then halfway houses, and finally into an apartment complex where things really came to a climax. I was pretty much drinking throughout- even sneaking at the halfway houses eventually. I held down menial jobs, sometimes working slightly intoxicated or so hung over that I would sometimes have to take breaks to go into the bathroom to throw up. It was bad. I detoxed and got sober countless times for brief periods, but always relapsed due to depression, anxiety, and intense and unrelenting cravings. It just seemed impossible to go my entire life dealing with those cravings and staying miserably sober, so I’d finally give up and give in to what I felt was the inevitable. I became more and more depressed and hopeless. Finally my boyfriend and I failed miserably at our last attempt to try to create a sober life together and I guess I gave up, that last month spiraling into total self-destruction. I put myself in really bad situations. I got hurt. I was anxious and I was scared. I was living very day-to-day, and needed so much not to be living in the reality of my situation that I was doing pretty much anything to continue drowning myself in booze. I’m not sure when and how my mom found out about ATMC, but this is when she intervened and insisted I go into the program. At this point I welcomed it. I really didn’t know what I was going to do. I felt I’d dug myself into a hole so deep that there was just no possible way for me to get myself out. As I said before, I was hopeless. And I mean utterly and completely and to my core hopeless. I honestly don’t remember much about the first couple days. I remember crying when I arrived at ATMC. I remember just wanting to crawl into bed to go to sleep. I remember planting myself on the couch the next day and watching tv. I don’t remember talking much to anybody. Then I don’t know what happened. My first coherent memory is talking to my ex after about 5 days of being there and being in great spirits, telling him that it was great and that everybody was like a “family.” I loved the atmosphere, I loved the food, and I had hope again. It really was amazing how quickly my spirits changed. So I’m not quite sure how to explain what happened. It really was just everything. I was an emotional mess and the safe, loving environment went far. Being surrounded by people (my peers and the staff) that understood, didn’t judge, and quickly became good friends was key. Despite the very serious undertones, we seemed to manage to make a good time of it. There was definitely a lot of laughing. Then of course was the physiological aspect. I was very surprised after taking an initial test to find that I had ridiculously high levels of some heavy metals and very low levels of several important nutrients. Basically, my chemistry was off and could have been affecting me negatively for a very long time. The supplementation and chelative process made sense to me and I believed in it, so I threw myself into it. They embarrassingly nicknamed me “the warrior” at the Detox Shoppe because I guess I went a little turbo. I was just dedicated to getting as much out of the facility as possible. And I wanted so much for my cravings to let up. I religiously took my supplements, worked out, did the ionic footbaths, and spent as much time as I could in the sauna. Finally, I changed my eating habits. Before ATMC I would have argued that I was an extremely healthy eater, but after all the classes I learned that, unfortunately, my diet had me consuming a very unhealthy amount of preservatives, caffeine, aspartame, and genetically modified foods, which I believe was making it impossible for my body to achieve a natural chemical balance. All I know is that once I started actively getting toxins out of my system and eating and drinking as healthily as possible, I really did notice a considerable difference in how I felt, both mentally and physically. I’m over a month out of the program now, and it all still seems to be working. I feel really good. I mean, of course I would feel physically better now that I’m not ingesting all of that alcohol on a daily basis, but it’s something more. Most strikingly, my cravings are “different.” Before I craved ALL the time and they were just so intense. Now, when I have them, they’re completely manageable. I can reasonably accept that they’re there and that I’ll still have them for a while, perhaps forever, but I don’t NEED to feed them. Also, I’m not NEARLY as mind-obsessed about alcohol anymore. It’s not the number one thing on my mind ALL THE TIME. I go full periods without even thinking about it, which doesn’t sound like much unless you’re an alcoholic like I was. Then it’s seriously glorious to stop and realize you haven’t thought about alcohol at all in like 4, 5 hours or whatever. I have a smile on my face right now just thinking about it. So right now life is good. I quickly decided I did not want to go back home after I graduated. If I actually did it this time, if I became free from addiction, all I wanted was a simple life and for me, well, I just couldn’t see that happening in Phoenix. 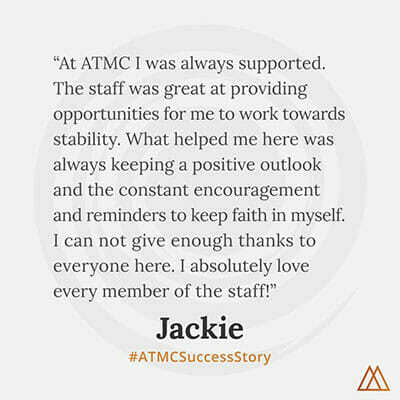 I wanted a slower pace of life, and I feel safe here and it allows me to stay close to the ATMC community, which has become very important to me. I’m actually interning right now for ATMC. They have an After Care program that allows you to kind of wade back into normal life rather than jumping right back in. So I’m working part time, giving me time to keep actively working on my health and sobriety. I still sauna, take my supplements, go to a group a week, see a counselor, and hang out with everybody from the program. It all keeps me busy and makes me feel productive – like I’m moving forward. I became really close with the girl I shared a room with while I was a resident, and we got a great little place together. My dog’s back with me. For the first time since I can remember, I’m hopeful and excited about my future. Back when I started the program I said to somebody that I just wanted to feel strong again, and I do. What can I say – I can’t complain.